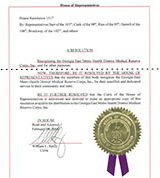 MRC GEM (East Metro Health District Medical Reserve Corps, Inc.) is a Georgia non-profit corporation and with IRS 501(c)(3) approval. Donations are tax deductible as provided by the Federal and state tax codes (click to see our IRS approval letter in a separate window). Your Kroger Plus Card can help support our programs at no cost to you. 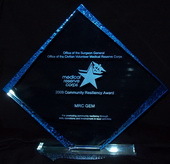 Go to https://www.kroger.com/account/enrollCommunityRewardsNow to enroll your card in support of MRC GEM. (If you haven't already registered your Kroger Plus Card online, you'll be able to do so.) Then search for MRC GEM (organization #30127) and select us as your supported organization. Once you do, Kroger will donate to us a percentage of what you spend. You can donate cash directly and conveniently through the PayPal giving fund using your credit card or PayPal account. The full donation amount comes to us; PayPal charges no fee for this service. For independent confirmation of our non-profit status, please see Guidestar's page about us. If you have any questions about donating, please contact donations@mrcgem.com.